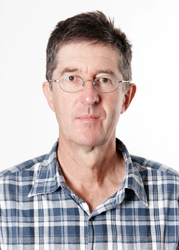 Graham's research is concerned primarily with the institutional economics of governing social-ecological systems. A particular focus is on how community-based, polycentric governance systems influence the self-reliance of landholders in managing such systems. He is author of the influential book Economics for Collaborative Environmental Management: Renegotiating the Commons where he developed a framework for assessing the adaptive efficiency of policy and institutional options for such management. An emerging focus of his research is on the institutional economics of strengthening rural livelihoods in developing countries by promoting innovation in livestock value chains. Marshall, G.R., 2015. ‘A social-ecological systems framework for food systems research', International Journal of the Commons 9(2): 881-908. Curtis, A., Ross, H., Marshall, G.R., Baldwin, C., Cavaye, J., Freeman, C., Carr, A., and Syme, G.J., 2014. 'The great experiment with devolved NRM governance: Lessons from community engagement in Australia and New Zealand since the 1980s', Australasian Journal of Environmental Management 21(2): 175-199. Marshall, G.R., Connell, D. and Taylor, B.M., 2013. 'Australia's Murray-Darling Basin: A century of polycentric experiments in cross-border integration of water resources management', International Journal of Water Governance, 1, 197-218. Marshall, G. R. 2013. 'Transaction costs, collective action and adaptation in managing complex social-ecological systems'. Ecological Economics. 88: 185-94. Marshall, G.R. 2011. 'What 'community' means for farmer adoption of conservation practices', in D.J. Pannell and F.M. Vanclay (eds), Changing Land Management: Adoption of New Practices by Rural Landholders. CSIRO Publishing, Melbourne, pp. 107-127. Marshall, G.R., 2010. 'Governance for a surprising world', in S. Cork (ed), Resilience and Transformation: Preparing Australia for Uncertain Futures. CSIRO Publishing, Melbourne, pp. 43-52. Marshall, G.R. and Stafford Smith, D.M. 2010. 'Natural resources governance for the drylands of the Murray-Darling Basin'. The Rangeland Journal. 32(3): 267–82. Marshall, G.R., 2009. 'Polycentricity, reciprocity, and farmer adoption of conservation practices under community-based governance'. Ecological Economics. 68(5): 1507-20. Marshall, G.R., 2008. 'Nesting, subsidiarity, and community-based environmental governance beyond the local scale'. International Journal of the Commons. 2(1): 75-97.